Welcome on arrival , evening flight, at Yangon Airport, and transfer to hotel. Dinner at a reputable restaurant. Overnight in Yangon. After early breakfast, transfer to Airport for domestic flight to Mandalay, just an hour flight from Yangon. On arrival at Mandalay Airport, proceed to Amarapura, the former Royal City before Mandalay was born. Excursion to Mahagandayon Monastery to see the daily life of the Buddhist monks. Visit 200-year-old U Pein teak bridge, built in 1782 spanning the TaungTha Man Lake. Continue to Mandalay and check in Hotel. Excursion to Shwenandaw Kyaung <Golden Palace Monastery> a superb example of Myanmar traditional wooden building and Kuthodaw Pagoda, built by King Mindon in 1868, It also known as the World's Biggest Book for its 729 marble slabs engraved with Buddhist scriptures. Then drive to Mandalay Hill, 230 metres in elevation, for a panoramic view of the city and its surrounding areas at sunset. Dinner and overnight in Mandalay. After breakfast, sightseeing to picturesque and peaceful Sagaing Hills across the Ayeyarwaddy River. 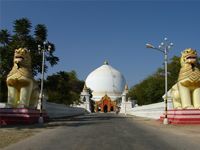 SagaingHills are covered with numerous pagodas and monasteries, and hence well known as a retreat for Buddhist devotees. Continue to Khaung Hmu Daw, huge dome-shaped pagoda, a copy of the Mahazedi Pagoda in Sri Lanka. On the return journey, visit the silver and pottery workshops at Ywa Htaung and Oo Bo villages. Lunch at a local restaurant and drive back to Mandalay. After lunch, a boat-trip on the Ayeyarwaddy River to Mingun about 11Km (1 hour) upriver from Mandalay. Visits to Mingun Bell, claimed to be the largest ringing bell in the world; Mya TheinTan Pagoda, in memorial to the late Queen Sin Byu Me and the unfinished Mingun Temple, which could be the world's largest brick Pagoda if it was finished. Return trip to Mandalay. Dinner and overnight in Mandalay. After breakfast, transfer to Airport for return flight to Yangon. On arrival at Yangon, start sightseeing trip in Yangon City. Visit to Shwedagon Pagoda, the landmark of Yangon and one of the world's most spectacular religious monuments. It is said to be built over 2000years ago enshrining the hair relics of Buddha. Continue to Chauk Htat Gyi, to see the huge reclining Buddha Image and then to gilded Sule Pagoda, over 2000 years old, and still stands as the landmark of Yangon City Center. Proceed to Bogyoke (Scott) Market where hundreds of stalls of souvenirs and handicraft shops can be visited. After Lunch, visit the National Museum to see the 8 meters high Golden Lion Throne and Mandalay Palace Royal Regalia, utensils, manuscripts, etc. In the evening, transfer to airport for Departure. Visitors can continue to other interesting tourists destinations such as Pyin Oo Lwin <Maymyo>, Lashio, Monywa, Bhamo, Myitkyina and Inle Lake from Mandalay. 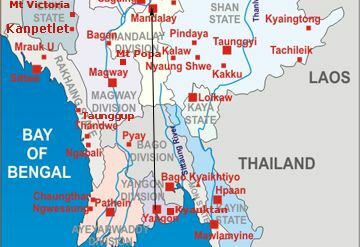 Visitors can also proceed from Mandalay to Bagan by motor-road of Mandalay-Meikhtila-Bagan or by river cruises along the Ayeyarwady River.